We’d love your help. Let us know what’s wrong with this preview of A Christmas Carol and Other Christmas Stories by Charles Dickens. Dicken's most beloved story, A Christmas Carol, is as much a part of Christmas as mistletoe and carolers. This heartwarming tale continues to stir in us the same feelings of repentance, forgiveness, and love that transformed Ebenezer Scrooge. To ask other readers questions about A Christmas Carol and Other Christmas Stories, please sign up. As near as I can tell, A Christmas Carol is perfect. It embodies, in a very real way, Christmas itself. Charles Dickens is justly famous for his big, sprawling, shaggy-dog serials, in which he spun intricate and twisty tales with the loquaciousness of a man being paid by the word. They are filled with dozens of characters, all of them lovingly observed, most with a laundry list of quirks. They are filled with ups and downs and more ups and more downs. They are seemingly designed to avoid reaching any sort of conclusion. Indeed, many of his epics, such as Bleak House and Great Expectations, have an ad hoc feel to them, as though Dickens himself was as uncertain of his ending as the reader. Not so with A Christmas Carol. A Christmas Carol is short, efficient, and tightly focused. It has a natural symmetry and a wonderful simplicity, with just a handful of characters and an all-time killer hook: greedy old miser Ebenezer Scrooge is visited, upon Christmas Eve, by four apparitions (Jacob Marley and the Ghosts of Christmas Past, Present, and Yet to Come) who teach him a powerful lesson about the meaning of the day. This is a book with a message, a thesis statement, yet it entertains while it preaches. 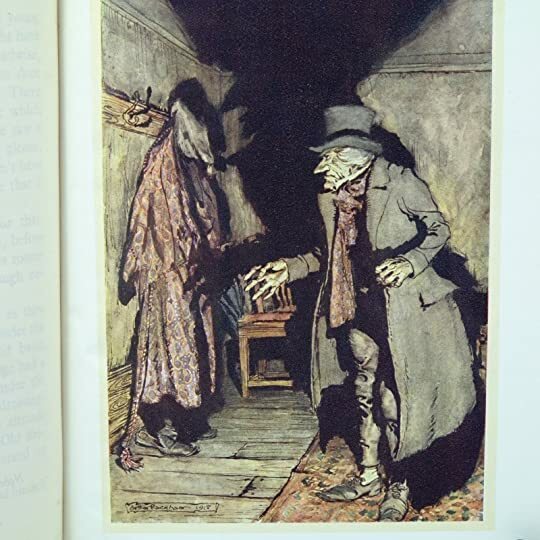 The visit from his long-deceased partner Jacob Marley (“dead these seven years”), sets out the parameters of the story: that three other ghosts will visit Scrooge to teach him the meaning of Christmas, and by extension, how to live a better life all the year long. The first meeting of man and ghost, a seriocomic scene set in Scrooge’s bedchambers, is classic Dickens, and manages to balance pedantry with humor (by way of some un-improvable dialogue). Though he looked the phantom through and through, and saw it standing before him; though he felt the chilling influence of its death-cold eyes; and marked the very texture of the folded kerchief bound about its head and chin, which wrapper he had not observed before; he was still incredulous, and fought against his senses. “Much!” – Marley’s voice, no doubt about it. 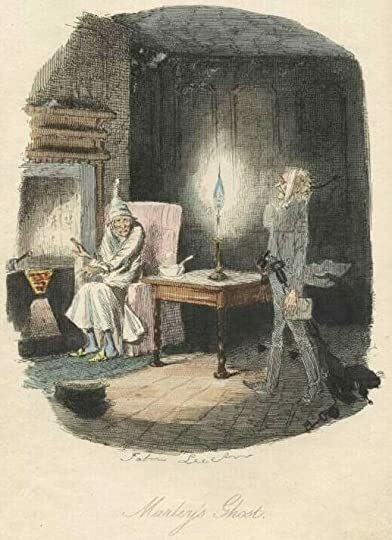 After Jacob’s departure, Scrooge repairs to his bed, to await the other ghosts. 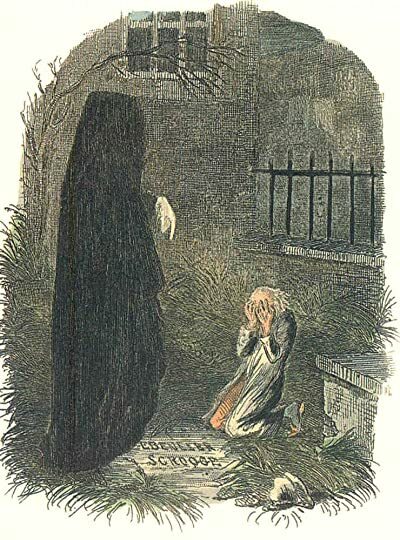 First is the Ghost of Christmas Past (“Long past?” “Your past”),who transports Scrooge to his childhood, where we learn of Scrooge’s strained relationship with his father, his close relationship with his sister, and the lost love of his life, a woman named Belle, who Scrooge forsook for money. The scenes with the Ghost of Christmas Past have always been my favorite, because they toy with the very foundations upon which Christmas is built: a slightly melancholic nostalgia for the way things were, or how we remembered them to be. Next, the Ghost of Christmas Present arrives. He presents as a jolly man, but the longer we spend time with him – meeting Scrooge’s clerk, Bob Cratchit, and his crippled son, Tiny Tim; looking in on the Christmas party of Scrooge’s nephew, Fred – the more of a dark pedagogue he becomes. By the time Christmas Present takes his leave, he is lecturing us about Ignorance, Want, and Doom (in many ways, he is the drunk uncle we all know and tolerate). Finally, there is the Ghost of Christmas Yet to Come, who shows Scrooge the misery and death that awaits if he does not change his ways. The silent specter is an oppressive presence, and represents Dickens at his most on-the-nose, banging away at his points with a hammer. Yet, it all sets up exquisitely for a rousing finale. A Christmas Carol has been adapted hundreds of times. Thousands, if you count local theaters. It is a testament to Dickens’ creation that most of these adaptations hew so closely to the original. There is no need to add, subtract, or tinker. (On the subject of adaptations, if you ever see me at a Christmas party, I will be happy to explain my theory on how every Christmas movie springs from A Christmas Carol). This particular volume also includes other Christmas stories and writings by Dickens. Frankly, they barely rate a mention, at least relative to A Christmas Carol. It is hard to be interested in these minor offerings when compared to the alpha dog of all Christmas literary offerings. It’s a bit like having your Bugatti test drive interrupted by some dude who wants you to try his skateboard. In the spirit of charity, I suppose there is some merit in studying these other stories, if only to compare and contrast them to A Christmas Carol. For instance, in The Story of the Goblins Who Stole a Sexton, you see many of the elements (a Christmas humbug, ghosts) that Dickens would later use to better effect. In The Haunted Man and the Ghost’s Bargain, written post-Carol, Dickens introduces another pedagogic specter. This ghost allows a man named Redlaw to lose all memories of his sufferings and sorrows, with generally bad consequences. This story blatantly attempts to capitalize on the popularity of A Christmas Carol – complete with a lesson! – and unfortunately indulges in Dickens’ weakness for overly-wacky characters. Dickens has been called “the man who invented Christmas.” Obviously, that is not literally true. And it is not really figuratively true, either. Dickens was, in fact, building on traditions that far predated his classic fable. His bit of genius was to take this holiday and give it transformative power. Not only a day of celebration, but a day of contemplation. Not just a time to think about mulled wine and plum pudding, but to ponder those who are poor, sick, or struggling. “Christmas won’t be Christmas without any presents,” Jo grumbles at the start of Little Women, twenty-six years after the publication of A Christmas Carol. Such is the current state of Christmas. Those Cratchit kids, though, would never think such a thing. They’d never dare utter such a complaint; even the smallest goose was enough to satisfy them. The values espoused in A Christmas Carol are timeless and meaningful. But it is more than a parable. More than any other book or movie or song or play, A Christmas Carol draws us intimately into the best parts of this yearly celebration. That is why I have never tired of the story, no matter how many times and in how many ways I have experienced it. I love A Christmas Carol, whether it is in Muppet form, or Magoo form, or George C. Scott form, or Patrick Stewart form, or the original novella, which I read every year. In Scrooge’s rebirth, marked by a turkey as big as a child, and the promise of parties featuring a bowl of smoking bishop and Blind Man’s Bluff, we are given a version of an idealized Christmas: the table is full, family is present, and the children are healthy. In presenting this idealized Christmas, Dickens manages to capture the importance of memory. When you were young, time started to slow in December, and then stopped completely during that hour-long church service standing between you and your gift-wrapped toys. As you get older, Christmas comes and goes much quicker, and leaves you weighing this year’s festivities (often unfavorably) to all that came before. Years pass, and the composition of your family changes through addition and subtraction, through birth and death. Coming as it does so near the end of the year, Christmas becomes a transitory signpost. Our Christmas traditions, though, push back against mortality, and place us instead along a continuum. Sure, maybe Grandma is gone, but her ornaments are still on the tree, glittering like they have since World War II. Tradition keeps her alive, and will keep us alive when we are gone. I have a tradition of reading something by Dickens over the Christmas holidays. Sometimes a full novel, often a short story, mostly re-readings of A CHRISTMAS CAROL, this being my favorite of all Dickens' writings. This year I read this with a good friend from Good Reads. It was his introduction to Dickens and my keeping up with tradition. Rather than writing a review for this I thought I would make some general observatio Old Marley was as dead as a door-nail. I have a tradition of reading something by Dickens over the Christmas holidays. Sometimes a full novel, often a short story, mostly re-readings of A CHRISTMAS CAROL, this being my favorite of all Dickens' writings. This year I read this with a good friend from Good Reads. It was his introduction to Dickens and my keeping up with tradition. Rather than writing a review for this I thought I would make some general observations I have on the work. 1) It is a timeless biblical story of redemption and grace without reference to any scripture. But reading A Christmas Carol you somehow feel that Charles Dickens knew what he was doing. 2) Dickens writes a better ghost story than most horror writers do. 3) Dickens must have been familiar with Hindu philosophy as karma is a prevalent theme. 4) I can't help but think that Scrooge is largely biographical -- a profound confession by a man terrified at the way he may have misspent his life amongst his fellow human beings. 5) Although it is a ghost story, it is largely optimistic and filled with hope. 6) Dickens was very bright as he saw the role ignorance would play in the world. Look at how the world has been dumbed down and how it, ignorance, has played a role in Brexit and in Trump's appointment to the presidency. 7) Question for you, is A Christmas Carol a manifesto from Dickens? [First read: 2010 or thereabouts. 4 stars. Second read: Christmas 2015. 4 stars. Ghost stories were the theme of Christmas during Victorian times and it's a tradition that is sorely missed. Charles Dickens is pretty much King of Christmas, and all these stories have a spectral vibe to them. They all contain the same kind of feeling to them, and give us a meaning to Christmas that I think we've let go of a little. Even I of a Scrooge nature feels blessed after [First read: 2010 or thereabouts. 4 stars. Ghost stories were the theme of Christmas during Victorian times and it's a tradition that is sorely missed. Charles Dickens is pretty much King of Christmas, and all these stories have a spectral vibe to them. They all contain the same kind of feeling to them, and give us a meaning to Christmas that I think we've let go of a little. Even I of a Scrooge nature feels blessed after I have read these stories, not only because I enjoy all of Dickens' works, but because it gives me faith of a non-religious kind that Humans are pretty much alright, actually. 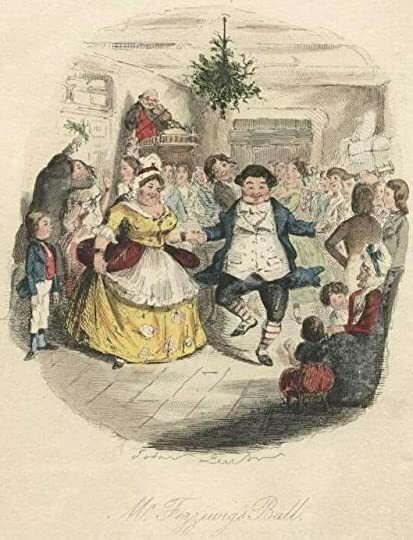 'Christmas Festivities': Under the pseudonym 'Tibbs', Dickens implores those who are less enchanted by Christmas than they used to be to let it back in to their hearts. Fairly relevant today, but his arguments do not convince me wholly. 'The Story of the Goblins Who Stole a Sexton': pre-cursor to A Christmas Carol and is an evocative imaginative short tale. Humble but with a lot to say. 'A Christmas Episode from Master Humphrey's Clock': Just a small segment from this story, which was serialised in several of his other novels, which shows how a kindness done at Christmas time can bring you more joy than you ever really appreciate. 'A Christmas Carol': With a transformation that would make Bumblebee turn green, Scrooge is the epitome of a Christmas junkie: too much and all at once after all those years of refusing. I'm surprised be didn't die of such an overdose of turkey and whooping. Surprisingly shorter than I ever remembered it to be. 'The Haunted Man': Very enjoyable and surprisingly longer than A Christmas Carol, though without the overall worldy blesséd live that emanates from that one: the same kind of feeling and plot, with poor families and various deaths. I think it was perhaps longer than it should have been, though the ending and message was not so bad because of that. A great memory to all the dead and how we should never forget them.
' A Christmas Tree': An odd little story that doesn't quite make sense. A good reference for what a Victorian tree would have been decorated like, but vague and rather tedious altogether. 'What Christmas is, as we Grow Older': quite droll and rather boring in truth, but I think it is a nice insight in to how Dickens thought about a lot of things. 'The Seven Poor Travellers': A condensed version of A Christmas Carol in a way, though not so much Scrooge than someone trying to make themselves feel better by helping others. Fairly archaic in plot and tone, but an ideal sentiment nevertheless. A classic Christmas tale, Charles Dickens’ A Christmas Carol tells the story of Ebenezer Scrooge, a miserable old man, who is visited by his deceased business partner and the Ghosts of Christmas Past, Present and Yet to Come one Christmas Eve. Their intention is to help Scrooge realise the error in his ways and to help his transform into a better person. Everyone knows the story of A Christmas Carol – the story has been adapted numerous times and these movies are watched by a lot of people each Christmas. Admittedly, A Christmas Carol was never my favourite Christmas movie, I think I watched it once as a child and just didn’t “get it”. So I thought it was time to read the story instead, and safe to say, I really enjoyed it. I even went on to watch A Muppet’s Christmas Carol after with a renewed interest in it and have a feeling I’ll now revisit it annually. It’s a great book to get yourself into the Christmas spirit, Dickens really excels at creating that atmosphere and the way you feel around the festive period. Scrooge’s character development and overall tale of redemption is well-executed and he becomes pretty likeable by the end. I love how it really represents what Christmas is all about – showing empathy and generosity and generally trying to be a better human. Well, to be honest, that’s how we should be all year around! But we all know Christmas is the time that people do show extra compassion towards each other. So, yeah, I really enjoyed A Christmas Carol and would give it 4 stars. 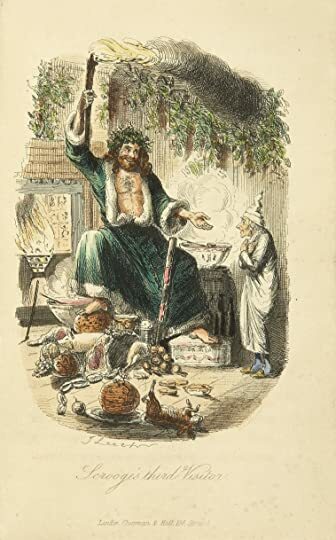 Only Mr Charles Dickens could ever dream of animating Christmas Fayre with his wonderous prose as he does some chestnuts and a Spanish Onion in A Christmas Carol . There were great, round, pot-bellied baskets of chestnuts, shaped like the waistcoats of jolly old gentlemen, lolling at the doors, and tumbling out onto the street in there apoplectic opulence. There were ruddy, brown faced, wide –girthed Spanish Onions, shining in the fatness of their growth like Spanish Friars; and winking from thei Only Mr Charles Dickens could ever dream of animating Christmas Fayre with his wonderous prose as he does some chestnuts and a Spanish Onion in A Christmas Carol . There were great, round, pot-bellied baskets of chestnuts, shaped like the waistcoats of jolly old gentlemen, lolling at the doors, and tumbling out onto the street in there apoplectic opulence. There were ruddy, brown faced, wide –girthed Spanish Onions, shining in the fatness of their growth like Spanish Friars; and winking from their shelves in wanton slyness at the girls as they went by, and glanced demurely at the hung mistletoe . The way he relates the visitations of the spirits indeed I include the visit of Marley who he sees’ first in the knocker on his door are so visual in the description that as I said this morning the film makers over the years of this tale been made had a relatively easy time of it because the characters were all there so well formed and described. I loved this book , it was the first time of reading it for me and I have a feeling that I may read it again if not all of it then for certain parts of it before Christmas. So Mr Dickens for me you are the master at story telling .I thank you for your stories and cannot wait to read more in the coming year. p.s If you read only one book over Christmas make it this one it is joyous. Each time I read this story it is more perfect. I see the characters in my minds eye especially the spirits that visit our poor Mr Scrooge. I won't add anymore quotes into my review but just a little note to myself for next year about Mr Fezziwigs party, so well described I felt I was there watching with Scrooge and the spirit of Christmas past. Re re re re read December 2018. I will read A Christmas carol every year.It is for me the best Christmas story. this never fully grabbed my attention, but i never minded reading it. i've of course seen the story done before (community theater! the mickey cartoon! etc etc) so it wasn't fresh by any means, but i'm glad i read it. bottom line: this is a good read-in-a-lifetime book! i recommend it. The early pages of A Christmas Carol remained so familiar that I thought it might be basically impossible to review the book. It was simply itself and that's how it was. Goodness knows how many times I'd read them when I was growing up - I'd been given two different editions as presents before the age of ten, and would have opened and browsed them frequently. The only surprises were that some of Scrooge's anti-Christmas rants were genuinely funny, and that he was suffering from a cold throughout proceedings. However, I found it less familiar once I hit Stave Two, and more possible to think about it as I would another book, although every now and again, there were occasional sentences that had resounding familiarity from childhood, because they'd just got into my head, like "who and what are you?" or because they were probably captions to illustrations in other editions. It was hard to tell whether this is an effect of my own early habituation to the text, or if I was spotting genuine influence at work, but there is a tone here which seems like the essence of British children's writing, especially, though not only, children's fantasy writing, and fantasy stories which aim to have cross-age appeal. Did Dickens essentially invent it? Or did he simply popularise it so that almost everyone since has been influenced via his work? Probably its greatest contemporary exponent is Neil Gaiman - including with that storyteller voice and occasional authorial breaking of the fourth wall that has become connected with the trust many readers have in his public persona (a clause which I feel could be saying equally about Dickens or Gaiman). I don't read much in the way of contemporary children's or YA, but it's also the tone A.L. Kennedy was going for in her Little Prince spin-off, The Little Snake, which I read a few months ago. Often the sentences seemed astonishingly modern - noticeably more of them would work in contemporary writing than would sentences from, for example, Henry Fielding, written a century earlier. Perhaps this is due to the overwhelming popularity of the Carol which has led a huge readership and reuse, often unwitting, of many of the phrasings. I did not find myself struck by modernity of wording in the same way when I read the less popular Hard Times a couple of years earlier. But just when I was marvelling at all this, of course there would come along some paragraph really quite antiquated and tangled to 21st century ears, showing that this is indeed still a work of 1843. What never would have occurred to me as a kid is that Scrooge is essentially forced through a rapid course of psychotherapy in order to effect personality change - only he didn't seek it out himself. (Did Freud read much Dickens?) Its transformative outcome in either three days or one, depending how you measure time in the book, is one that promoters of accelerated programmes like the Hoffmann Process can probably only dream of. He is made to examine how the past made him who he is, including a number of painful moments which reawaken a dormant capacity for a variety of emotions; he is shown the adverse effects he has on others, and his separation from what are considered healthy social norms; and then to reinforce it all, just in case his repentance - to use a term from religion that would have been recognisable to early Victorians - is not yet deep and sincere, he is forced to look in the eye the probable future consequences of his current way of life. His response to the final Spirit is basically the idea of psychological integration: "I will live in the Past, the Present, and the Future." 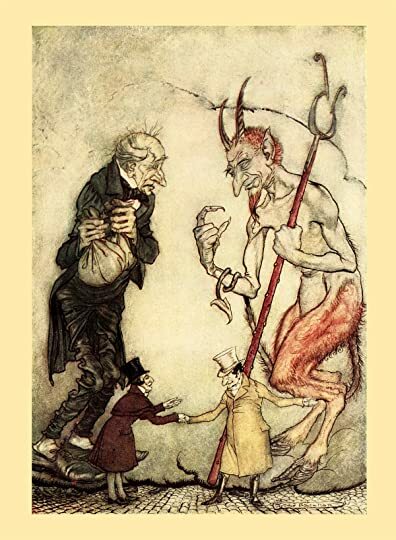 The abundance of works like this one, showing great positive change in difficult people, can also lead to frustration over the years, as one gradually discovers that, in the reality of adult life, people do not necessarily change and 'grow' as much as would be helpful - but that is hardly peculiar to A Christmas Carol. There were ruddy, brown-faced, broad-girthed Spanish Onions, shining in the fatness of their growth like Spanish Friars; and winking from their shelves in wanton slyness at the girls as they went by, and glanced demurely at the hung-up mistletoe. There were pears and apples, clustered high in blooming pyramids; there were bunches of grapes, made in the shopkeepers’ benevolence to dangle from conspicuous hooks, that people’s mouths might water gratis as they passed; there were piles of filberts, mossy and brown, recalling, in their fragrance, ancient walks among the woods, and pleasant shufflings ankle deep through withered leaves; there were Norfolk Biffins, squab and swarthy, setting off the yellow of the oranges and lemons, and, in the great compactness of their juicy persons, urgently entreating and beseeching to be carried home in paper bags and eaten after dinner. The notes in this edition seem very good. There is very little in the way of material so obvious it's patronising, and only a couple of things missed out which could have done with notes: " a twice-turned gown" and " like a bad lobster in a dark cellar" (in 2018 the combination of lobsters and basements made one think of Jordan Peterson fans; goodness knows what greater significance it had in 1843). Something I keep mulling over more generally about Dickens is how he was, in his day, so effective in his social reform agenda, and so well-loved by readers, whereas fiction doing the same now - not least because he's done it before - easily comes across as either mawkish, or written by and for a particular small audience (which has in the past couple of years come to be called 'liberal elites'). As far as I can work out, reasons for this on a larger scale would have included the reform-mindedness of some 19th century parliaments, the prevalence of some strands of Christianity, and the abundance of cheap energy fuelled industrialisation which required better education and thereby societal participation of workers. Whereas nowadays many people are aggrieved about declining standards of living, making them feel, en masse, less inclined to share, and the economic underpinnings have a different trajectory. (Not that Dickens didn't have opponents, of course. The introduction mentions that the Westminster Review condemned him, in June 1844, for his ignorance of political economy and the ‘laws’ of supply and demand: ‘Who went without turkey and punch in order that Bob Cratchit might get them – for, unless there were turkeys and punch in surplus, some one must go without – is a disagreeable reflection kept wholly out of sight [by Dickens].’ But this was a predictable reaction from Utilitarian extremists. ('Utilitarian extremists' seems somehow an absurd phrase now, if utilitarianism is an abstract idea from introductory philosophy courses, but evidently they were a thing!) Yet although the sight of the poor was surely more familiar to the wealthy of the 18th and 19th century than to their 21st century contemporaries in many western cities, people were shocked by reports on working and living conditions - Earlier in the year  he, like Elizabeth Barrett and many others, had been appalled by the brutal revelations of the Second Report (Trades and Manufactures) of the Children’s Employment Commission set up by Parliament.. Were many shocked this way, or were plenty of others inured? There was evidently some shift of ideas and sentiment which I've not really read about, and of which Dickens was no doubt part - it was not just underlying economic factors, even if they are the growth medium - which made those with power gradually start caring more and doing more. The biggest change was the post-WWII welfare state, but there was a broad trajectory of improvement over the century or so before that. Something I'd like to read more about. The books published by the “Readers Digest Association” are always beautifully produced, albeit they do not have ISBNs and perhaps are not regarded as mainstream publishing. This one is no exception. It is a hardback, with a green leatherette cover, and a red spine. Gold tooling is used for the title, the author, and for the decorative border. Inside, the paper used is heavy quality, smooth and creamy white (not glaring) and the print is dense and clear. It is sturdily bound, does not stay open, but equally is easy to hold open at the correct angle. As I say, they are nice, quality books. This one contains the first three stories from the collection of five “Christmas Books”, written by Charles Dickens. The first is the perennially popular “A Christmas Carol” from 1843. The following year he wrote “The Chimes” which was published at Christmas in 1844, followed by “The Cricket on the Hearth” for Christmas in 1845. He was to write two more, but their popularity decreased year by year, so from then on Dickens was to write a considerable shorter Christmas story to publish in his magazine, and there are twenty more of these. 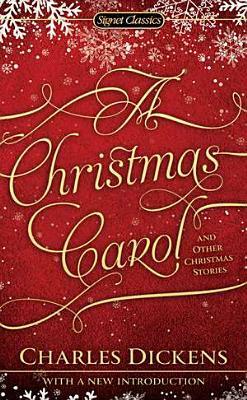 The first ever Christmas book, the novella “A Christmas Carol”, has been published in many editions. This one has the rare treat of including copious illustrations by the very talented - and unmistakable - Arthur Rackham, one of the leading illustrators from the “Golden Age” of British book illustration, during the first half of the 20th century. There are watercolours, incorporating some outline pen work, pen and India ink drawings, and silhouettes, all of which are listed at the beginning. The first page of the text is devoted to a list of characters, printed with a border, and looking rather like a theatre programme. The text follows with each colour illustration given a full page, and the black and white ones varying. “The Chimes” also has illustrations by Arthur Rackham: watercolours, ink drawings, and silhouettes as before, although there are fewer because this is a shorter book. The characters in this one too are listed at the beginning. “The Cricket on the Hearth” published for Christmas in 1845, uses different illustrators: Robert and Barbara Buchanan. 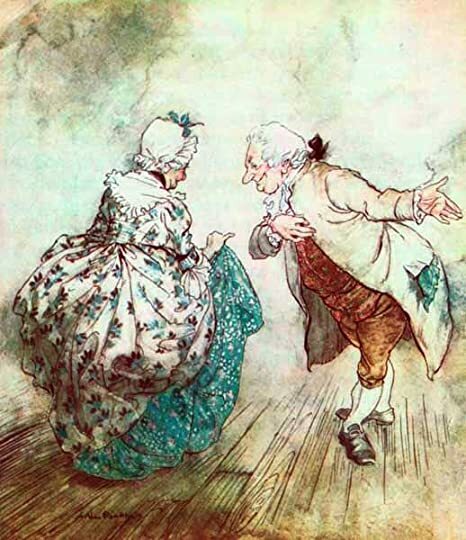 Although an attempt has been made to match the techniques, the palette, and the style used, these are clearly modern illustrations, with none of the energy, verve and character of Arthur Rackham. Altogether though, this is a lovely book to have. Even Dickens’s two short Prefaces have been included, and there are a few pages of an “Afterword”, adapted from “The Greatest Little Book in the World” by A. Edward Newton, which was first published in 1923. Whenever I start a book like this, I expect for it to put me in the Christmas mood, and so it did! From the very first page, I could feel the crispness of the snow under my feet and the chill of the weather, and I didn't mind at all that we were in a graveyard! Most of these Christmas stories contain pure magic - I especially loved the Sexton one and the legendary A Christmas Carol. Other stories didn't intrigue me that much but they still put me in the mood for Christmas. So all in all, I would Whenever I start a book like this, I expect for it to put me in the Christmas mood, and so it did! From the very first page, I could feel the crispness of the snow under my feet and the chill of the weather, and I didn't mind at all that we were in a graveyard! "I have always thought of Christmas time as a good time; a kind, forgiving, charitable, pleasant time; the only time I know of, in the long calendar of the year, when men and women seem by one consent to open their shut-up hearts freely." I suppose that a story that is so ubiquitous during Christmas time as this one needs no introduction. I can see why it has been constantly popular for more than one hundred years. I appreciate the writing and craft that goes into the story, the social commentary, the worthy morals, and the affection that generations of readers have for it. But I hated it. Yes, it's official, I'm the Grinch and (pre-reformed) Scrooge rolled into one. I have a heart made of stone, or at least something equally har I suppose that a story that is so ubiquitous during Christmas time as this one needs no introduction. I can see why it has been constantly popular for more than one hundred years. I appreciate the writing and craft that goes into the story, the social commentary, the worthy morals, and the affection that generations of readers have for it. But I hated it. Yes, it's official, I'm the Grinch and (pre-reformed) Scrooge rolled into one. I have a heart made of stone, or at least something equally hard, immune to the plight of tiny, poor, crippled tots and destitute Victorian families who couldn't afford a stuffed goose for their Christmas tables. I found the story to be simplistic, with sketchy, largely one dimensional characters, and so drenched in sugary sentimentality that it made my teeth hurt. I can deal with sentimentality, but such a massive, industrial-strength dose of it renders me comatose, instead of being genuinely moved. How can you rate one of the greatest morality novellas of all time? It's a Christmas classic! Preaching compassion, sympathy, empathy and generosity, A Christmas Carol is beautifully written, atmospheric, playful and politically charged. Ho letto solo "Canto di Natale", che merita sicuramente 5 stelline. Una di quelle storie che tanto si sanno, ma vale la pena leggere perché lo stile è davvero incantevole...e perché un po' di sano spirito natalizio scalda sempre il cuore! The book also contains two other Christmas stories. This was supposed to be my December read. Oh well, who needs to stick strictly to monthly TBRs anyway?? I blame this on you, Hallmark, with your Christmas movies playing on TV in November! You got me craving so no one can really blame me for this, right? I rounded this novel up to 4, as an average for all the stories in this novel. This novel is a collection of Dickens' Christmas stories, including "A Christmas Carol", five other Christmas-themed stories, fourteen very short Christmas stories, and three short Christmas stories he co-wrote. For the sake of time and space, I have only included the five Christmas stories in this review. A Christmas Carol: 5 Obviously. There is no need to sum up this story's plot so I won't go into it. This story i I rounded this novel up to 4, as an average for all the stories in this novel. This novel is a collection of Dickens' Christmas stories, including "A Christmas Carol", five other Christmas-themed stories, fourteen very short Christmas stories, and three short Christmas stories he co-wrote. For the sake of time and space, I have only included the five Christmas stories in this review. A Christmas Carol: 5 Obviously. There is no need to sum up this story's plot so I won't go into it. This story is the most recognized and traditional Christmas story in history and I thoroughly enjoyed it. Chimes: 4 "Trotty" is a pauper who is struggling to survive in a world that believes he (and others like him) should be "put down". The chimes from the bells of the local church ring out the rhythm to his life. When he falls down the church tower and has a near-death experience, he returns to his life determined to value those he holds dear. This story is similar to "A Christmas Carol", except for the fact that Trotty is a pauper, and he appears to be undeserving of his harsh experiences. A Cricket on the Hearth: 3 Told from the point of view of "the narrator", the young, newly married couple that are the protagonists, hear a 'cricket on the hearth' and deem that to be good luck. The story is a love story between Dot and John (our cricket homeowners), May and Edward (their young friends), and Caleb and his blind daughter. This story is not Christmas themed (in reality, the young couple were married on New Years and they talk about how their one year anniversary is coming up) and unrealistic to the extreme. (We are to assume that rich, old Tackleton will simply give up his bride-to-be because he knows she is in love with someone else, who has miraculously returned to town). Dickens' stories are hard to follow with his archaic, poetic language, and this story had no plot, which made it even more of a challenge. The Book of Life: 3 This story takes place around Christmas but does not have a strong holiday theme, and, like its previous stories, it revolves around a near-death experience which challenges the main characters to re-examine their world views. In this story, one sister sacrifices the love of her life for her sister (who has been in love with him for years) which, although altruistic, is also unbelievable and speaks to the dated era of Dickens. I thoroughly enjoyed the roles of Clementine and Britain however, the two destined housekeepers. 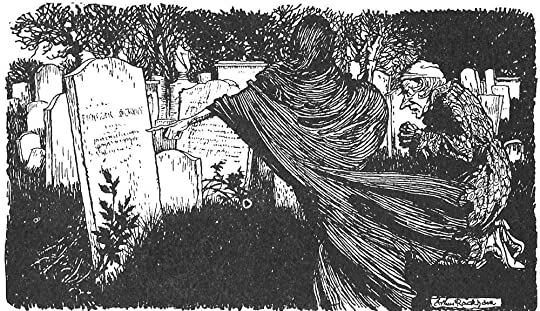 The Haunted Man: 4 This story is most similar to "The Christmas Carol". Our main character, the Chemist Redlaw, has had his memories of loss, pain and trauma taken away from him (voluntarily) and he spends the plot of the story trying to regain them, as he learns that he cannot fully appreciate happiness without the counterweight of sadness. Not particularly Christmas-themed either, but the theme is very reminiscent of the season. I enjoyed the introduction particularly, as it detailed the life of Charles Dickens and how he came to write "A Christmas Carol" and its subsequent stories. I became entirely obsessed with his life after this, and believe he deserves full props and respect for being the literary figure he is. These stories are difficult to read due to their poetic language (think Shakespeare) but the themes remain true and the literary caliber is five-star. I read this every year and it totally gets me in the Christmas mood. Christmas - love and hope - the truest essence of joy, generosity, grace, and mercy - is so beautifully and imaginatively conveyed through Charles Dickens' A CHRISTMAS CAROL. One of my favorite Christmastime stories of all times. One can be rich in materialism, wealthy beyond measure, but poor and loathsome in spirit. A real Bah Humbug - Scrooge. And one can be poor or of modest means by the world's standards, yet rich in all things of priceless, eternal worth. Such as Bob Cratchit (love the play Christmas - love and hope - the truest essence of joy, generosity, grace, and mercy - is so beautifully and imaginatively conveyed through Charles Dickens' A CHRISTMAS CAROL. One of my favorite Christmastime stories of all times. One can be rich in materialism, wealthy beyond measure, but poor and loathsome in spirit. A real Bah Humbug - Scrooge. And one can be poor or of modest means by the world's standards, yet rich in all things of priceless, eternal worth. Such as Bob Cratchit (love the play on words, chit being a voucher owed). Or Fezziwig (another great pun), who was blessed materialistically yet also generous, kind, jovial, and caring. While reading A CHRISTMAS CAROL, I found it quite uncanny how I kept envisioning the film version starring Jim Carrey; the verbiage, dialogue and prophetic specters were genuinely and brilliantly captured by writer/vissionary-storyteller Robert Zemeckis. As for the other two Dickens tales, they weren't nearly as delightful or appealing as A CHRISTMAS CAROL. THE CHIMES, from my perspective, was altogether bizarre. Not to mention, morose and rambling on top of being overtly political. Perhaps if I were better versed in eighteenth and nineteenth century British history/politics/customs, I might have found the deeper meaning of those peeling bells and Alderman Cute. THE CRICKET ON THE HEART was an interesting little story. I liked the characters, human and otherwise; the teakettle was a fun imaginative pairing to the Cricket). And the character names, natural-world puns, were also frolicking, telltale puns. Though I enjoyed this story, to a casual degree, once again I found my lack of extensive British-isms and history to be my downfall. Otherwise, I might have fully grasp the deeper meaning behind the "chirping" fray. I would also like to make note, the anthology's addendum - mini-bio and forward written by an unnamed READERS DIGEST staff member - was quite fascinating. Prior to, I wasn't aware of Dickens' trips to the United States reading his Christmas novelas in dramatic 'Reader's Theatre' fashion to factory workers and those of lesser means - not merely to the elite or scholarly literary circles. The afterward by A. Edward Newton in 1923 was equally enlightening. According to Newton, THE CHRISTMAS CAROL has been "translated into almost every language under heaven" And a letter penned by Robert Louis Stevenson, as told by Newton, states: "I don't know that I would recommend you to read the 'Carol', because it is too much, perhaps. But oh, dear God, it is good - and I feel so good after it, and would do anything, yes, and shall do everything to make the world a little better . . ."
Indeed, the world is a better place for Dickens and his Christmas Carol - in prose - for inspiring us all to be kinder, gentler, more forgiving, more generous, more loving - and give God the praise. Il Canto o Ballata di Natale ***** semplicemente fantastico, è banale dirlo ma risveglia proprio lo Spirito Natalizio, ideale, visto il ritmo dei nostri giorni che ci rende difficile apprezzare queste sensazioni, leggerlo in questo periodo di feste. Il Grillo del focolare *** è quello che mi ha lasciato più perplessa. Ho avuto alcune difficoltà di comprensione della lettura; non ho capito se per causa mia o per problemi di traduzione o per dei riferimenti che non ho afferrato, ma mi sono ritrovat Il Canto o Ballata di Natale ***** semplicemente fantastico, è banale dirlo ma risveglia proprio lo Spirito Natalizio, ideale, visto il ritmo dei nostri giorni che ci rende difficile apprezzare queste sensazioni, leggerlo in questo periodo di feste. Il Grillo del focolare *** è quello che mi ha lasciato più perplessa. Ho avuto alcune difficoltà di comprensione della lettura; non ho capito se per causa mia o per problemi di traduzione o per dei riferimenti che non ho afferrato, ma mi sono ritrovata spiazzata da cambi subitanei d’ambientazione, dall’apparire improvviso, all’interno di una scena, di personaggi che fino un attimo prima non c’erano e quindi dover rileggere il paragrafo per arrivare a capirci qualcosa. Il patto con il fantasma **** altro bel racconto di Natale. Curioso che, proprio l’assenza dei sentimenti e delle emozioni come la compassione, possa redimere e farne capire l’importanza, comprendendo che ciò che siamo è determinato dal ns. retaggio sentimentale alla cui costruzione hanno partecipato tutte le ns. esperienze siano esse tristi o felici e che, senza alcune di esse, saremmo delle persone diverse. Le campane ***** racconto che ho adorato tanto quanto Il canto di Natale. Contrariamente a Il Grillo del focolare, qui mi sono ritrovata catapultata all’interno delle pagine del libro; io non stavo leggendo. Io ero lì a vedere con i miei occhi ciò che stava succedendo, per esempio, con la descrizione iniziale io ero dentro qualsiasi chiesa, di notte, a vedere il vento prendere forma ed animarsi in quel “suo modo sinistro di errare tutt’intorno … e di lamentarsi nel suo cammino”. Per certi versi il contenuto di questo racconto è attualissimo rispetto al periodo in cui stiamo vivendo. Christmas writings seem to often be drenched in nostalgia - even T.S. Eliot succumbed to it with The Cultivation of Christmas Trees. Dylan Thomas is another example. Dickens is no exception, with additional syrupy sentimentalism and overt Christian evangelism mixed with supernatural elements. Other famous Dickensian themes are also present; urban poverty and social injustice. I found much of the book forgettable, the exceptions being the two longer stories, A Christmas Carol and The Haunted Man. Christmas writings seem to often be drenched in nostalgia - even T.S. Eliot succumbed to it with The Cultivation of Christmas Trees. Dylan Thomas is another example. Dickens is no exception, with additional syrupy sentimentalism and overt Christian evangelism mixed with supernatural elements. Other famous Dickensian themes are also present; urban poverty and social injustice. I found much of the book forgettable, the exceptions being the two longer stories, A Christmas Carol and The Haunted Man. The former had little impact, bled of all power by exposure to countless pop culture re-tellings. The latter made more of an impression - not only unfamiliar but showing some skill at atmosphere in the supernatural parts, which I could have wished for more of. The moral that our sorrows, troubles and wrongs are what make us empathetic and compassionate is as heavy handed as the tone of the much more famous tale of Scrooge. I absolutely loved the different themes Dickens talked about in his Christmas writings. It did feel a bit repetitive at times, as it was made of stories set at Christmas with similar themes and I did enjoy some more than others (my detailed ratings will come tomorrow), but I loved A Christmas Carol so much that it outshined the rest. A perfect read to be in a festive mood at the end of the year! It, like Oliver Twist, is a minor Dickens work in scope, but its truths are momentous truths & its aesthetic sensibilities remain breathtaking and ahead of their time. The quintessential perennial novel and for very good reason. Though I don’t believe in ghosts, and certainly don’t believe that anyone is cursed to “go forth” in death if they didn’t in life, it was a very vivid picture of the chains we all end up trapped in at some point—the chains that only God can free us from. Marley’s chains were made of cash boxes and other things related to the miserly business he and Scrooge conducted. It was a sobering reminder that we aren’t to get so caught up in our business that we forget to be a blessing in other peoples’ lives. And that’s something we all need to remember from time to time—both during the Christmas season, when it seems to come so naturally, and the rest of the year. Also, I’d just like to say that Scrooge is one of the most well-thought-out characters that I’ve ever come across, especially in older fiction. In the beginning Dickens introduces him as the most tight-fisted, crotchety old miser there ever was, but then he colored in his past and made me pity him, since he hadn’t always been that way, and by the end, Scrooge has undergone a tremendous change in his arc, and his joy at having been given a second chance was palpable. Admittedly, it’s got to be tough to be the story that comes directly after A Christmas Carol, but I didn’t enjoy this one as much. It was a biting satire highlighting the way rich people brainwash themselves and the poor people under them with comfortable lies—comfortable lies about how they’re a Friend and Father to the poor when they really do nothing but Put them Down. That made it rather depressing, for a large part of the book, since the main character “dies” early on, and in ghostly form watches his beloved daughter travel a hard path on her own, and ultimately try to commit suicide, because she believes the lies. The darker feel of this one knocked off two stars, since I personally don’t enjoy that as much, but it was extremely effective in its satire, and the characters were vivid, and the plot as well thought out as ever, thus the three I left. I borrowed this for 'A Christmas Carol' and the rating is for that story only. Confession time--if I had ever read 'A Christmas Carol' before, it would have been as a pre-teen and we will not get into how may years ago that was. And even at that age I was already familiar with the story from seeing movie versions on television. However, the written story still managed to surprise me in several ways, so I am glad I finally got around to reading it. It is always good to go back to the source. And it I borrowed this for 'A Christmas Carol' and the rating is for that story only. However, the written story still managed to surprise me in several ways, so I am glad I finally got around to reading it. It is always good to go back to the source. And it is fascinating to consider how well the story has thrived across the years. "A Christmas Carol" is of course worthy of five stars, but as this is a review of the entire volume as a whole, I have settled on four stars instead. You can't say "Christmas" without saying "Dickens". It is an undying rule and also a tribute to how great a writer Dickens truly was. How he managed to capture the perfect essence of the Christmas spirit in one small book and therefore creating an everlasting mark on our way to perceive this particular holiday. It is both an astonishing and remarkab "A Christmas Carol" is of course worthy of five stars, but as this is a review of the entire volume as a whole, I have settled on four stars instead. You can't say "Christmas" without saying "Dickens". It is an undying rule and also a tribute to how great a writer Dickens truly was. How he managed to capture the perfect essence of the Christmas spirit in one small book and therefore creating an everlasting mark on our way to perceive this particular holiday. It is both an astonishing and remarkable accomplishment. Besides the classic Christmas Carol, I also enjoyed the little essay "Christmas Festivities", which was delightful and heartwarming to read. Dickens managed to portray the most wonderful Christmas scene in six pages and as I read it I couldn't help but to smile. I also loved the detailed description in "A Christmas Tree" where Dickens minutiously describes a Christmas tree and the thrilling fantasy flights it produces in the minds of children. "The Seven Poor Travellers" was enjoyable as well, however I did struggle with "The Haunted Man" which is why the rating ended on four stars. "Reflect upon your present blessings - of which everyman has many - not on your past misfortunes, of which all men have some. Fill your glass again, with a merry face and a contended heart." What struck me when reading this collection of Christmas writings was the nostalgic feeling Dickens associates with Christmas in general. In almost every story, Christmas is tightly connected with remembering the ones that has passed away and wishing them well wherever they might be. Nowhere is that as evident as in "What Christmas is, as We Grow Older", where Dickens seems to reflect upon the changes that each Christmas brings and the acceptance that is necessary in order to cope and move forward. How many can I get through before Christmas?